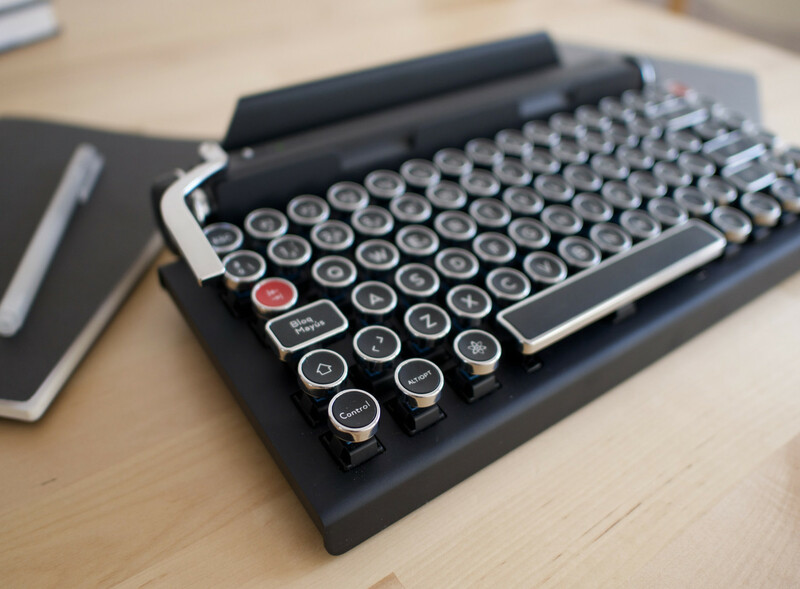 Qwerkywriter S mixes the experience of a mechanical keyboard and retro aesthetic of a typewriter to offer an elegant product, with interesting features and to which finding target audience can be as simple as it is complicated. The latter due to the price. We have been able to prove it, so we tell you how it is. 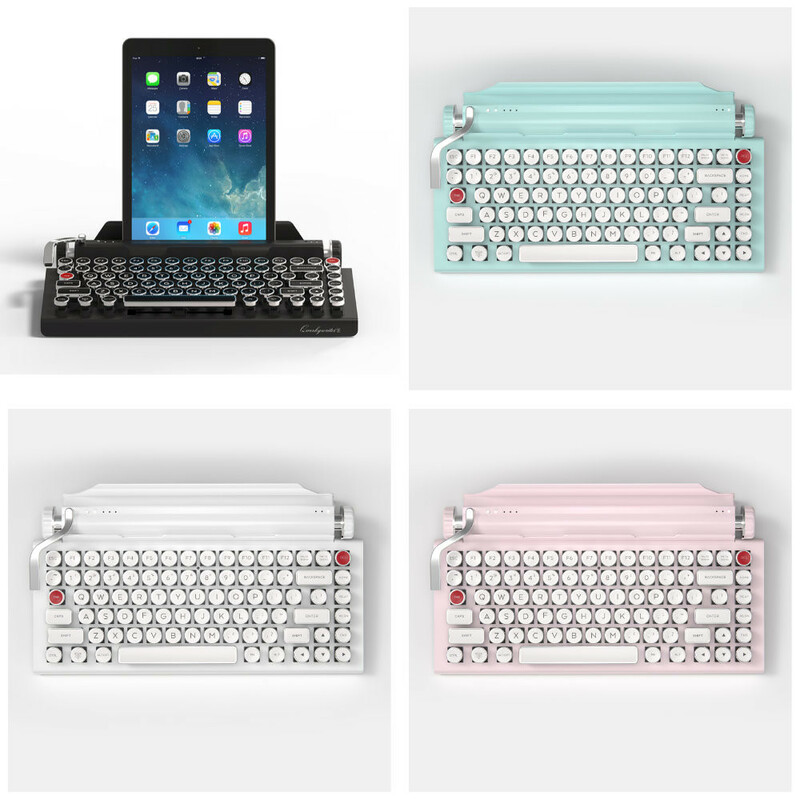 Qwerkywriter S is a mechanical keyboard that we can connect to our computer via USB cable or using its Bluetooth connectivity, which we can also take advantage of to use it with mobile devices such as smartphones or tablets (up to three devices). The ability to pair up to three devices and select which one to use at the push of a button is quite convenient. So that we can change between our computer, smartphone or tablet quickly. Focusing on the mechanical keyboard side we have Cherry MX Blue switches and three “special” controls. On the one hand two wheels that will serve to scroll or control the volume. And on the other a lever that simulates the return of the car of old typewriters. Here by default that lever works like the Enter key but we can program it to perform other actions such as cutting, pasting, etc. Regarding its use as a wireless keyboard, the integrated battery offers a range of up to 1 month. And to load it we will only have to connect the micro USB cable that it includes. Which as a detail comes with that nylon finish that is comfortable, robust and elegant pair. The design of this keyboard is undoubtedly its main attraction. With a metallic and plastic body for the other components physically attracts a lot of attention. 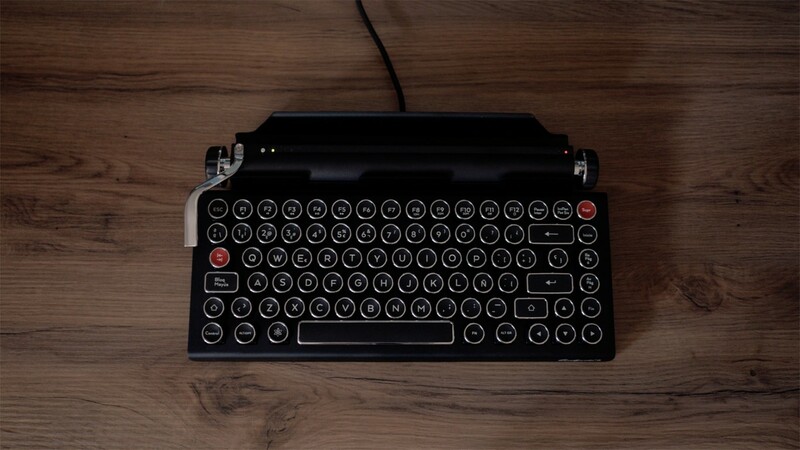 At first glance you can not tell if it is a computer keyboard or a real typewriter until you look a little more. But as we say is only the aesthetic, inside there is more technology as we have seen. 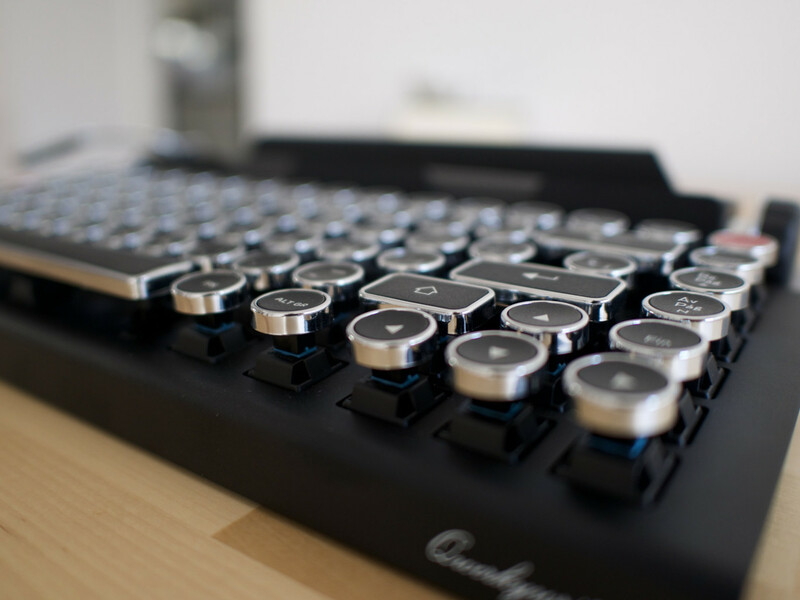 Regarding the keys, they have a circular design also characteristic of typewriters and use Cherry MX Blue switches to give a greater feeling of being pressing a typewriter key and not a PC keyboard. The Cherry MX Blue are clicky switchers, so we have a double auditory feedback to know that the pulsation has been made. As with other proposals of mechanical keyboards, be in favor of these switches against other options such as Cherry MX Brown, Red, etc … is a matter of taste. We can value a keyboard for many aspects but there is always one that is key: the writing experience. In this Qwerkywriter S we will not find anything new beyond the feeling and the pleasure of thinking that we are in front of an old typewriter. Although there are also some details that we should highlight. Like any mechanical keyboard with Cherry MX Blue switches, the pulsation of each key is very particular. Writing is something comfortable and once accustomed to the type of beat and stroke is true that we can improve the speed of writing and reduce fatigue when writing for long periods, but we have the problem of noise. The Cherry MX Blue may not be the noisiest but still make a very particular sound that in quiet environments could be especially annoying for other users. However, in these days of use what worried us the most was the period of adaptation so that our rhythm of writing was not impaired. Reason? The size of the keys. The circular keys have a size that you have to get used to. It is true that as the manufacturer says the stability is very good and once the answer is good. But if you are used to keys with a larger size and some distance between them at the beginning will be easy to fail and press where you did not want. So you have to practice to adapt as it would with almost any new keyboard and different to our usual that we buy. 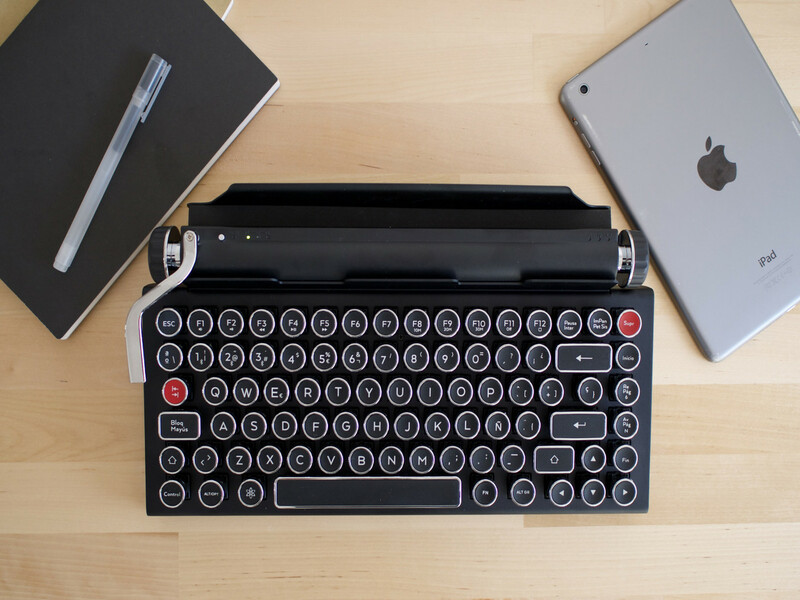 Keyboard, Qwerkywriter S, typewriter. Bookmark.